It seems either a lot of people are belly dancing or just like to dress up like a belly dancer. 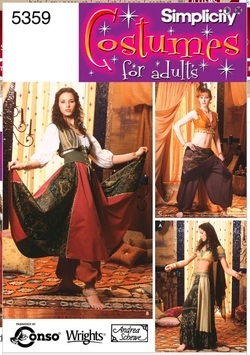 I then designed a more contemporary belly dancer costume, which again was well liked. 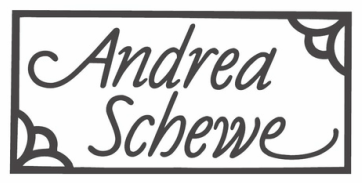 So ... below ... I got to design and even more traditional costume that coordinates with a second pattern for a gwazi coat that can be worn over the basic costume. Another feature of this costume is it contains an actual bra pattern. I purchases every bra pattern I could find and picked apart several bras to make this pattern. I even made myslf a bra and wore it around for a while to make sure it would be comfortable. Keeping with the middle eastern theme. This is a fun old pattern that I made in 2004. Alas, it didn't last too long. 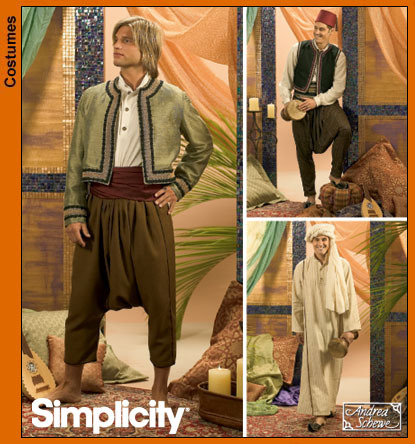 I guess not too many guys want to dress up in middle eastern garb. But, you can see what good sports my family is! 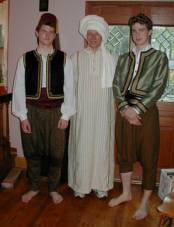 That's my husband in the middle and my two sons testing the fit before I sent these costumes in New York.